When I Saw You is the latest directorial offering from Annemarie Jacir, the first female Palestinian director. The story explores the response of the Palestinians to Israel’s victory in the six-day war of 1967, after which refugees flooded over the borders into Jordan. However, this is not an exploration of Middle Eastern politics, but rather a more personal examination of people’s lives. Young Tarek (Mahmoud Asfa) occupies a makeshift shack with his mother Ghaydaa (Ruba Blal) in a Jordanian refugee camp. Neither of them know the whereabouts of Tarek’s father, and it is slightly ambiguous as to whether his absence is connected to the war or to conflict at home. Tarek hates life in the camp and wants to go home, not understanding why they cannot just do so. His naive desire to return back where they have come from, shorn of all political understanding, effectively symbolizes the need of all people to live in the place they call home. However, despite the unpleasantness of life in the camp, Ghaydaa believes this is the safest place for them to be. We see her trying to educate Tarek about science, though Tarek himself cannot read and is thrown out of school because he is disruptive to the other children. When Tarek runs away to try and find his home, he is discovered by a “fedayeen”, a freedom fighter, who takes Tarek to his training camp where the boy is welcomed as one of their own. Shortly afterwards Ghaydaa tracks Tarek down. She plans to take him back to the camp, of course, but abandons this plan when she hears that napalm bombs have been dropped on the camps, as these are considered to be “recruiting grounds” for fedayeen. To his mother’s dismay, Tarek increasingly identifies with the fedayeen (which include women as well as men) and wants to be part of their fight. We never actually see any fighting, though, only training exercises led by Abu Akram (Ali Elayan), a commander who preaches class consciousness rather than religion, and who emphasizes the virtues of patience. 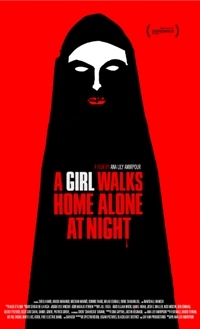 The film itself has an atmosphere of stillness about it. The people in the refugee camps are waiting, as are the fedayeen, all waiting – they know not how long – for the day they will reclaim their homeland. Whereas many contemporary films are filled with shaky camera action, almost all the scenes in When I Saw You are shot with a steady camera, which serves to emphasise the feeling of stillness and patience. 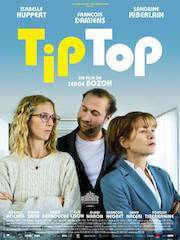 Ultimately, though – despite a somewhat unexpected ending – the film’s meditative emphasis on a people waiting does result in a story rather lacking in drama. 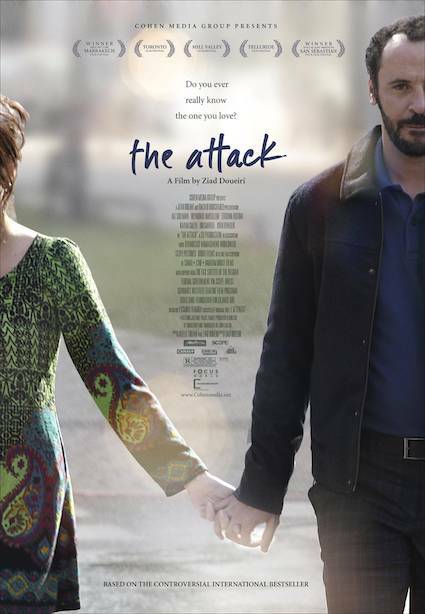 First released in 2012, The Attack is a story that addresses the Palestinian-Israeli conflict, yet has been banned in most Arab countries because it was partly filmed in Israel. This is a great shame because it is a splendid film. I caught up with it this week at the BFI in London. The film tells the story of Amin Jaafari (Ali Suliman), an eminent Palestinian surgeon who works with Jewish colleagues at a hospital in Tel Aviv. Just prior to receiving a major award, Amin’s wife Siham (Reymond Amsalem), who is visiting family, rings his mobile phone, but he tells her he cannot speak at that moment and will have to call later. Upon receiving his award, Amin gives a speech that acknowledges the difficulties of being a Palestinian in Israel, but expresses optimism for the future. The following day, whilst Amin is lunching with colleagues on the hospital terrace, the city is rocked by an explosion and shortly afterwards Amin is trying to save the lives of bloodied victims. We discover that a bomb exploded in a restaurant and most of the dead were children who had been enjoying a party. Later that night Amin is woken from sleep by a phone call and asked to come back to the hospital. Upon arrival he is asked to identify his wife’s body. She was killed in the explosion. The identification scene is truly distressing, because only the top half of Siham’s body is on the mortuary table. Shortly afterwards Amin is arrested by the police. They tell him that his wife’s injuries are such that she must have been the bomber. Based on this they assume that he, too, must have been involved. Amin’s interrogation is brutal, involving sleep deprivation, being forced to listen to loud music in his cell, and bullying questioning from tough shaven-headed cops. However, there is no evidence to substantiate Amin’s involvement and he is released. He goes home, only to find his house has been ransacked and graffitied, but then he discovers the letter that his wife has left him and the truth is revealed. She was the bomber. He then resolves to discover the terrorist cell who had brainwashed her (he assumes). What he discovers is a world of fear and distrust among family, friends, and the religious radicals he believes to be behind acts of terror. Even his Jewish colleagues at the hospital, who he had considered friends, and who are trying to be sympathetic to his plight, are now viewed with suspicion.